SANTA ANA, CA--(Marketwire - Mar 20, 2013) - Lisa Champion of Tustin, California was just recently named the winner of the System Pavers' Drab Driveway contest; conducted on Facebook. Homeowners throughout System Pavers' market areas were invited to post photos of their "drab" driveway in an effort to win a once in a lifetime driveway makeover. Contest entrants encouraged friends and family to vote for their cracked, worn and uneven driveways with hopes to take home the prize. 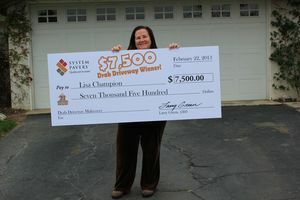 The winning driveway belonged to Lisa Champion, who brought in 413 of the 1,530 total votes. System Pavers has awarded her a $7,500 driveway makeover taking her driveway from drab to fab! "Winning this contest is a dream come true," said Champion. "I am beyond excited because now I will have a driveway that complements the beautiful landscaping I have in my yard, and reflects the passion I have for my career as a landscape professional." System Pavers is replacing Champion's asphalt driveway, originally built in 1959, with grey moss charcoal paving stones which reflect the colors of Lisa's home and her surrounding landscaping. "It's very rewarding for all of us at System Pavers to engage in contests that help homeowners improve their home's outdoor spaces," says Ila Barot-Oldakowski, Marketing Director for System Pavers. "Engaging with customers in ways that benefit them through helpful information or opportunities to win contests like this one is what we believe social media should be all about." System Pavers concludes another successful Facebook contest allowing fans the opportunity to compete for an outdoor makeover. Future contests and promotions will be announced at SystemPavers.com and on System Pavers' Facebook page. System Pavers has been providing top-quality surfacing solutions since 1992. It is the leading designer and installer of interlocking paving stones and outdoor living systems in the U.S., servicing California, and the Denver, Seattle, and Portland areas. Its mission is to enhance the lifestyles of its customers by proving attractive, long-lasting, and environmentally sustainable surfacing options for their pool decks, patios, walkways, and driveways. Visit SystemPavers.com for more information. Lisa Champion Wins the System Pavers Drab Driveway Contest on Facebook.